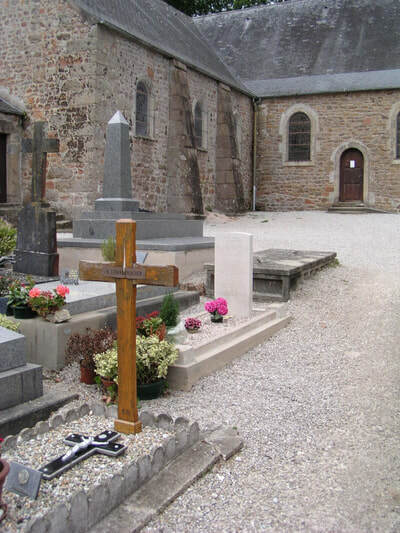 The village and commune of Fermanville is 14 kilometres east-north-east of Cherbourg. There are 3 Commonwealth burials of the 1939-1945 war here, 10 metres east of the north-eastern corner of the church. 42487 Pilot Officer Francis George Hurleston Dench, Pilot in 15 Squadron, Royal Air Force, died 13th August 1940, aged 22. Son of Herbert George and Helen Mabel Dench, of Beckenham, Kent. 581175 Sergeant Angus Nigel Gray, Observer in 15 Squadron, Royal Air Force, died 13th August 1940, aged 20. Son of George Albert and Evelyn Amy Gray. 615919 Sergeant Edgar Enoch Scrase, Air Gunner in 15 Squadron, Royal Air Force, died 13th August 1940, aged 19. Son of Edward William and Ellen Scrase, of Lower Kingswood, Tadworth, Surrey.